Residential life, co-curricular, and extracurricular activities are central to the NYU Shanghai experience. Living in our residence halls is a great way to be engaged in all aspects of NYU Shanghai. Students live in comfortable residence halls that offer co-curricular educational opportunities. Students occupy single, double or triple rooms on floors with 18-20 students and an upperclass resident assistant (RA), who also serves as a peer mentor. The rooms contain the basic amenities, including beds, desks with chairs and closets. Each floor has communal bathrooms and sinks, and students have access to shared kitchens and a washer and dryer. Along with the RA, Office of Student Life's Residential Life team serves as an additional resource and support system to students as they navigate the university environment. The Residential Life team is responsible for students’ experience in the residence halls, ensuring an environment that supports their academic goals and personal interests. The Residential Life team also creates a supportive yet independent community, transitioning students to the experience of living away from home. NYU Shanghai offers residential programming designed to promote learning outside the classroom, cultural appreciation, and a sense of community among students. Finally, the Residential Life team is responsible for upholding a high standard of conduct and safety in the residence halls. At NYU Shanghai, living in NYU Shanghai sponsored housing is mandatory for all freshman, sophomores and Study Away Students. NYU Shanghai juniors and seniors may live off-campus if they have submitted a NYU Shanghai Housing Waiver and Release and been approved to live off campus in accordance with the Off-Campus Housing Policy. For more information about residential life, please email shanghai.reslife@nyu.edu. 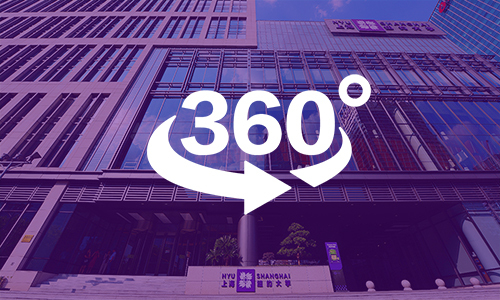 Explore the Pudong campus virtually in our 360-degree tour, stopping off at the state-of-the-art auditorium, library, science labs and more. In this tour, you can also visit Jinqiao residence hall and see where students live, or step off campus and see some of the sites of the city that are on our doorstep.